This groundbreaking collection of beautifully edited essays is impressive in both scope and depth. An invaluable and much-needed collection. An intellectually high-quality book proposal. It presents an excellent choice of scholarly perspectives on Kantor. The Theatre of Tadeusz Kantor edited by Magda Romanska and Kathleen Cioffi is an intellectually high-quality book proposal. It deals with manifold aspects of Tadeusz Kantor’s theatre and artworks. It presents an excellent choice of scholarly perspectives on Kantor. A range of the finest Kantor scholars of Polish origin contribute to the volume, some of them have mainly published in Polish so far. So it is a great opportunity for theatre scholars and a non-Polish speaking wider readership to get access to their research through this English volume. The book is suitable for both students and researchers as well as for readers generally interested in Polish and or Kantor’s theatre. A groundbreaking study of one of the most significant theatrical innovators of the twentieth century. The Theatre of Tadeusz Kantor is a groundbreaking study of one of the most significant theatrical innovators of the twentieth century. The editors, themselves leaders in this field, have assembled a truly impressive collection of international experts. This book is a major contribution to the study of Kantor, postdramatic theatre, the history of directing, avant-garde theatre, artistic responses to World War II, Polish studies, Jewish studies, memory studies, and object studies, among other disciplines/fields. The succinct essay structure will allow individual chapters to easily be assigned as required reading in both undergraduate and graduate classes. While many other books on Kantor exist, this volume is unique in its range and choice of topics. I highly recommend publication. This volume is unique in its range and choice of topics. I highly recommend publication. This unique anthology presents a selection of over seventy of the most important historical essays on comedy, ranging from antiquity to the present. Across its span it traces the development of comic theory, highlighting the relationships between comedy, politics, economics, philosophy, religion, and other arts and genres. A well-thought-out anthology… A superb selection of texts. Magda Romanska and Alan Ackerman’s Reader in Comedy is a well-thought-out anthology that embarks on a challenging enterprise: to provide an overview of theories related to comedy, broadly conceived, starting with the ancient Greek comedy and ending with the present-day sitcoms, vaudeville performances, slapstick comedy, and Internet humor. The general introduction, in turn, offers a valuable outline of the book: it explains the provenance of key terms, outlines debates on the role of comedy in particular periods, discusses typical comic plots and character-types, and ends with a brief synopsis of relevant theories of humor and laughter. Combined with the useful bibliographies following each of these prefatory studies, the Reader is an invaluable tool for teachers and students alike. The section on the twentieth and early twenty-first century, on the other hand, contains a superb selection of texts, from expected pieces by Luigi Pirandello, Jacques Derrida, Mikhail Bakhtin, and Northrop Frye, to insightful analyses by contemporary theorists, such as Glenda R. Carpio (with a piece on black humor in slavery fictions), Ruth Wisse (on Jewish humor), and Magda Romanska (on disability in tragic and comic frame). This selection provides, thus, an inspiring diversity of views on the modern comic theory that could inform courses on comedy and/or dramatic art in both literature and theater departments. The collection itself is worth a place on the shelf of any scholar who wants ready access to the long conversation about the role of laughter in literary life. The collection itself is worth a place on the shelf of any scholar who wants ready access to the long conversation about the role of laughter in literary life. Selections run from Plato and Aristotle through Simon Critchley, Linda Hutcheon, and essays from the most recent decade, with smart choices from Frye, Burke, Langer, Woolf, Derrida, and others who ought to figure more in current debates. A range [of readings] that a seminar might need for informed, provocative thinking about laughter and the literary imagination. A robust and useful primer for Western comedy theory through the ages. A strong collection of foundational texts. The task of assembling a reader is daunting, and editors Magda Romanska and Alan Ackerman admit the difficulty of their task up front. They model a clear acceptance of historical shifts in ideas on the function of comedy, providing rigorous contextualization that locates each idea in its moment in time, and makes this a robust and useful primer for Western comedy theory through the ages. After the “General Introduction,” which admirably establishes the comic vocabulary in use throughout the text and sets the stage for the rest of the book, the text is divided into five chronological sections covering “Antiquity and the Middle Ages,” “The Renaissance,” “Restoration to Romanticism,” “The Industrial Age,” and “The Twentieth and Early Twenty-First Century.” Each section contains an introduction of its own that deepens the discussion that was begun in the broader strokes of the “General Introduction.” Though each introductory section is, of course, focused on its respective time period, the editors mark reference points throughout, noting connections and contrasts that bridge the eras while looking forward and back along the evolution of writing on comedy. What [this volume] does—and does well—is assemble a strong collection of foundational texts for those looking to ground themselves in Western scholarship of the comic over time. The volume takes us clearly and concisely on its journey of exploring the genre. The passages which are presented demonstrate a considerable diversity in their interpretation of what comedy is, and should be. The question of how to define what comedy is or should be is one that can never be fully answered in literary and dramatic criticism. Magda Romanska and Alan Ackerman’s anthology embraces the difficulty in defining the genre that has existed since its inception in their lively and informed introduction, which is followed by sixty-four excerpts from literary and critical texts that reflect the changing definition of this slippery and amorphous genre. The volume takes us clearly and concisely on its journey of exploring the genre, with a particular focus on dramatic comedy. The passages which are presented demonstrate a considerable diversity in their interpretation of what comedy is, and should be. There is also a welcome range in terms of genre and time period. The main benefit of this collection is in presenting these texts together as a starting place for those interested in genre studies. It makes a welcome addition to the Bloomsbury Methuen Drama series. A temporally expansive analysis. It is a substantial anthology that interweaves performance studies, drama, literature, and critical theory. Each introduction to the chapters succinctly contextualizes the comic theory of its time and also links the annotated texts to previous chapters. Editors Magda Romanska and Alan Ackerman open their book by admitting the difficulty of their tasks: to historicize a genre so diverse in form and style and to define a genre (and its many subgenres) that itself resists definition. Rising to the challenge, the editors of Reader in Comedy: An Anthology of Theory and Criticism have created a temporally expansive analysis of western comic theory. Romanska and Ackerman’s collection of theoretical texts tells a story of how comedy and comic theory reflect and influence theatrical and performance conventions, social structures, technology, philosophy, and civic life. It is a substantial anthology that interweaves performance studies, drama, literature, and critical theory. Romanska and Ackerman have curated a collection that charts continuity in comic theory without diluting historical specificities. Each introduction to the chapters succinctly contextualizes the comic theory of its time and also links the annotated texts to previous chapters. Consequently, I would recommend this text for a survey course on comedy and comic theory in the United States and Europe, or to any scholar seeking a broad overview of writings on comedy. This is an immense resource covering a lot of ground. This anthology certainly has the range. In 64 extracts, this comprehensive anthology covers 2375 years of mainly philosophical texts in 375 dense pages. This is an immense resource covering a lot of ground. When choosing a theme like this, a motif to draw through history, it’s fascinating how many other aspects of personal, social and existential life begin to cohere around the topic. What one wants from an anthology is breadth as well as detail; one wants the reach but also the specifics. What’s important is not only the selection but making choices within the selection itself, knowing what to cut and paste. This anthology certainly has the range and there were, for me, many new discoveries, such as links with religion, aesthetics and diversity politics. Reader in Comedy arrives precisely when it is needed most, and it provides an excellent starting point for those looking for relief, resistance or both. A work of scholarship spanning this breadth of time, featuring the text of so many contributors, and from so many languages runs the risk of being bogged down by the weight of its information. In reaching backward and forward in time at so many points without creating confusion, the Reader is a testament to the work of Romanska and Ackerman. Reader in Comedy feels appropriately challenging and would make an ideal text for university-level coursework. As the unique challenges of the twenty-first century materialize, Reader in Comedy arrives precisely when it is needed most, and it provides an excellent starting point for those looking for relief, resistance or both. A very ambitious project … with remarkable breadth. 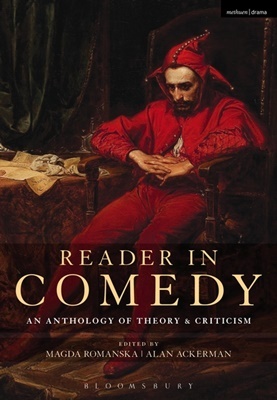 Romanska and Ackerman’s Reader in Comedy is a very ambitious project, which draws on a range of sources from antiquity to the twenty-first century to compile an authoritative volume of works about comedy. The editors have created [anthology] with remarkable breadth. An impressive cast of notable contributors. Reader in Comedy is a full, rich and highly informative anthology that can be dipped into time and time again. An impressive cast of notable contributors offers their definitions of comedy and its historical contexts, themes, narrative structures, plots, character types and tropes. As a valuable precis of historical writings on comedy, Reader in Comedy is a full, rich and highly informative anthology that can be dipped into time and time again. It traces the evolution of thinking about comedy and comic text and places this within a consolidated timeline. For the scholar of comic theory and criticism, this is an extremely valuable reference tool. Reader in Comedy presents a rich resource in helping students and scholars chronologically organize theories of humor, laughter, and comedy and demonstrates the dialogic nature of humor theories across continents and over centuries as well as the ways in which these theories are so often interrelated. A much-needed compendium on comedy tracking the narrative arc of the funny bone from Plato to the present day. A comprehensive and thoughtful selection of texts. This is a comprehensive and thoughtful selection of texts. All of the key theorists are represented and the book’s chronological structure is clear. There are useful introductions to each section, as well as a general introduction which offers a worthwhile overview. It is a perfect selection for courses on humour theory and literary humour. […] In short, it is the best on the market, and the editors are to be congratulated. With 85 articles by 90 leading theoreticians, practitioners and scholars, it is the most comprehensive anthology of dramaturgy to date, hailed as “exquisitely curated” “monumental volume.” This collection focuses on contemporary dramaturgical practice, bringing together contributions not only from academics but also from prominent working dramaturgs. The inclusion of both means a strong level of engagement with current issues in dramaturgy, from the impact of social media to the ongoing centrality of interdisciplinary and intermedial processes. It is not overstating the case to say that this volume will for sure be the book of reference for students, scholars, and dramaturgs. It is not overstating the case to say that this volume will for sure be the book of reference for students, scholars, and dramaturgs in the fields named above if it comes to questions of dramaturgy. The Routledge Companion to Dramaturgy goes far beyond a conventional handbook on dramaturgy as a way to structure a text to be staged. 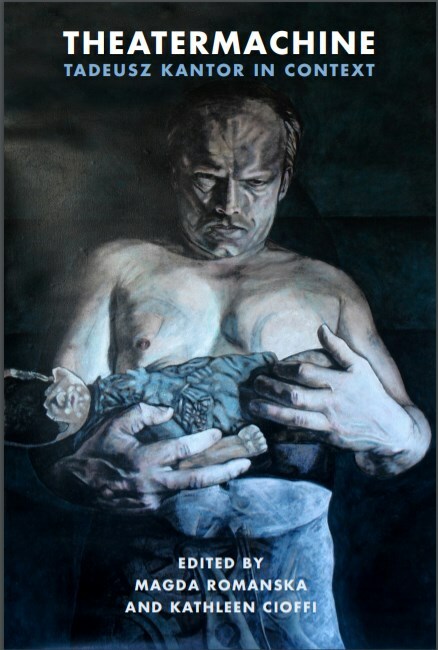 Rather, it claims attention to and evokes interest for the variety of a concept and a profession that not only covers crucial aspects of the field, but also implicitly highlights the richesse of dramaturgy as a field of study and therefore advocates theatre, performance and media studies as important disciplines that have a long history whose end is not in sight. The range of this book is, as stated, quite extensive: its depth is impressive. It is a singular, vital, and necessary contribution to the dramaturgical practice. The Routledge Companion to Dramaturgy honours the diverse and varied nature of dramaturgical practice. The range of this book is, as stated, quite extensive: its depth is impressive. Its sections take into account world dramaturgy; dramaturgy and globalization; the dramaturg as mediator and context manager (contexts being transculturalism, translation, adaptation, and contextualisation); dramaturgy in other art forms, such as film, dance, musical theatre, and gaming; the dramaturg in public relations, among others. As well as this, not only are these essays multifarious in scope, but they are also manifold in their written form. Its first section focuses on world dramaturgy and it was particularly satisfying to see the focus was not solely on Europe and North America, but also dramaturgical practices in Syria, Australia, India, Brazil and Latin America. Thus, the collection is at times instructive and often self-reflective. It functions as an introduction to dramaturgy in theory and practice, as well as facilitating a conversation about the profession and even acting as a survey of recent practice. To me, Romanska’s collection is a statement as to where contemporary dramaturgical practice is at present, whilst also envisioning its future(s). With its compiling of multiple voices, techniques, perspectives, and techniques into one compendium – once again, facilitating a conversation seems appropriate in this context – it is a singular, vital, and necessary contribution to the dramaturgical practice is at present, whilst also envisioning its future(s). With its compiling of multiple voices, techniques, perspectives, and techniques into one compendium – once again, facilitating a conversation seems appropriate in this context – it is a singular, vital, and necessary contribution to the field. It is an indispensable resource for anyone serious about dramaturgy. The book makes a virtue of its eclecticism and allows both term and role to appear across an array of contexts, conceptualisations, and performance practices. Some of the more practical, methodological accounts of dramaturgical work address areas that are underrepresented in other publications. It is an indispensable resource for anyone serious about dramaturgy. 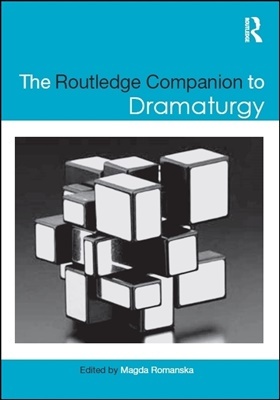 The Routledge Companion to Dramaturgy offers comprehensive coverage of dramaturgical theory and practice. With eighty-five essays, The Routledge Companion to Dramaturgy offers comprehensive coverage of dramaturgical theory and practice. The wide range of essays emphasizes versatility and adaptability and the continuing relevance of analytical research processes in professional theatre and education. Contributors address practice from new play development to video game story-boarding, from composition in the university classroom to immersive theatrical experiences in prison barracks, and for performances with dance or puppetry. The Routledge Companion to Dramaturgy will prove highly useful in theatre and performance practice, education, and scholarship. Artistic directors, directors of individual productions, and early career and long-time dramaturgs will find support for their artistic missions and new ideas for audience development and outreach. At the college level, undergraduate students will benefit from the insights into text analysis and applications of performance history, while educators will find pedagogical encouragement and inspiration. Finally, scholars of performance and theatre will appreciate the wide-ranging coverage of dramaturgical theory in the rehearsal room and literary classroom. An impressive range of voices and insights. A timely gift to the world of contemporary theatre. Romanska’s intro is magisterial, managing to address, with astuteness and depth, what dramaturgy was, is, and can be. A timely gift to the world of contemporary theatre. As the newest of collaborative roles in theatre-making, dramaturgy is well established in some performance cultures and still viewed with suspicion in others. The Routledge Companion is a testament to this much-misunderstood practice, and will greatly assist the recognition and consolidation of dramaturgy as an art.This impressively varied volume includes, in its 8 parts, 85 essays that shine different forms of light on dramaturgical theory and practice. Romanska’s intro is magisterial, managing to address, with astuteness and depth, what dramaturgy was, is, and can be. A robust, impressively comprehensive volume. It reveals the established, emerging, and imagined ideas of what dramaturgy is and could be. Romanska has put together a robust, impressively comprehensive volume that covers the ever-broadening scope of contemporary dramaturgy within a global context. There is no attempt to define dramaturgy here; instead the intent is to explode open what possibilities the notion of dramaturgy holds in practice and in scholarship. With 85 essays—covering topics from production dramaturgy, translation, season planning, play analysis for nonconventional drama and performance, dramaturgical skills and strategies to the use of social media and new paths for audience outreach—this volume reveals the established, emerging, and imagined ideas of what dramaturgy is and could be. It includes essays that provide global perspectives from the Americas, Europe, Asia, and Africa. The contributors range from those who have long been invested in the conversation (for example, Elinor Fuchs, Mark Bly, Anne Bogart, and Ann Cantaneo, to name but a few) to new, fresh voices. The volume is destined to become a go-to reference for practitioners and students of dramaturgy, along with directors, critics, playwrights, and theater scholars. Romanska has set herself a formidable task in editing this volume. Romanska attempts to provide a map of contemporary dramaturgical practice and theory, bringing together practising dramaturgs and academics who provide a range of perspectives in their contributions. Romanska has set herself a formidable task in editing this volume. [The book provides] a wide range of working methods in postdramatic theatre outlined in clear terms. 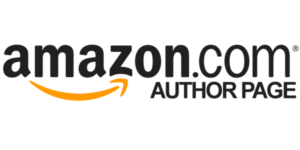 Official selection for the Book Expo of America 2015 – the largest publishing event in North America. The Special Exhibit highlights the best works in English in the field of Polish Studies published in the last decade. The Post-traumatic Theatre was the only theatre theory book on this very selective list. Magda Romanska answers questions about her latest book, The Post-traumatic Theatre of Grotowski and Kantor. Feature article and interview about The Post-traumatic Theatre of Grotowski and Kantor. In her book, The Jewish Advocate writes, Romanska claims that not only must both directors’ innovations be understood in the context of Polish history and culture, but also that the Holocaust is at the center of this history. Podcast: Magda Romanska discusses her new book, The Post-Traumatic Theatre of Grotowski and Kantor on NewBooksNetwork. In her new book, Magda Romanska bridges the disciplinary divides between theater studies and Slavic studies, between the history of Poland in the twentieth century and the history of avant-garde theatre. The book demonstrates how both productions were deeply political responses to that “taboo subject.” Romanska painstakingly works to decode [it]. An invaluable resource. Romanska persuasively argues that the two seminal works named in her title have been vastly under-studied and widely misunderstood; through extensive research, she aims to recover their literary, linguistic, historical, and cultural contexts. At the most basic level, the book assails critics (primarily American) for the hubris of thinking they can review, teach, write about, or even begin to comprehend Akropolis and Dead Class without knowing “Polish,” by which Romanska means the language itself, of course, but also Poland’s literature and history, and its profound relationship to the Holocaust. She demonstrates how both productions were deeply political responses to that “taboo subject,” but written under Soviet repression in a “coded language” that Romanska painstakingly works to decode. At its largest level, the book reaches beyond the ostensible objects of its study to boldly indict the entire field of Performance Studies as an inherently flawed mode of inquiry. She seeks to restore meaning to those two productions by retrieving their sources; the larger implication of her study is to challenge contemporary scholars to follow her model by conducting similarly rigorous inquiries into other theatrical work. Those who do know and teach these pieces will undoubtedly find Romanska’s work to be an invaluable resource. Her book will also serve as a provocation to scholars in the fields of theatre and performance, as she throws down the gauntlet, challenging them to reconsider the question of meaning in productions by replacing subjective “responses” with rigorous, contextual analysis. This text is a valuable resource for those looking to better understand the complex creativity of Grotowski and Kantor within their Polish historical, social, and literary context. 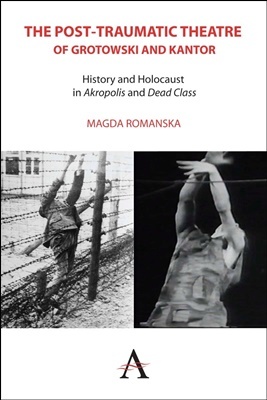 Addressing a gap in western scholarship, Magda Romanska expertly and accessibly places these central works [Jerzy Grotowski’sAkropolis and Tadeusz Kantor’s Dead Class] into the cultural and historical context she convincingly argues is essential to their understanding. This text is a valuable resource for those looking to better understand the complex creativity of Grotowski and Kantor within their Polish historical, social, and literary context. [The book] is not only a rich explanation of these dramatists, but also serves as an engaging overview of the Polish literary tradition. Romanska offers a broad introduction to Grotowski and Kantor, as well as the historical and literary tradition of which they are a part. Of particular interest is her concise explanation of their respective theatrical philosophies, as well as the complicated traditions of Jewish mysticism and Romantic messianism that reverberate through the works. Richly documented chapters. Through its argumentation and design, the book demonstrates a sophisticated dramaturgical strategy for re-historicizing and recontextualizing theatre and performance events. Richly documented chapters interweave primary sources, critical commentary, and contemporary theory (for example, Adorno, Agamben, Bettelheim, Améry) on each topic. Through its argumentation and design, the book demonstrates a sophisticated dramaturgical strategy for re-historicizing and recontextualizing theatre and performance events. The book also introduces English-language students to a significant national literature and encourages them to undertake equally rigorous, culturally specific readings in their fields of interest. Romanska opens up areas of these two productions which have been unavailable. Non-Polish-speaking scholars of Grotowski and Kantor will be grateful for Romanska’s work. She opens up areas of these two productions which have been unavailable; trauma and Holocaust survivors will be glad to be made aware of them; and Romanska indicates the direction for further analysis in this area. The task, which the author sets out and performs, starting from such a clearly defined research perspective, is both remarkable and impressive in its momentum and size. Romanska’s fundamental objective is to reconstruct and provide the complex historical and cultural context that is necessary for a proper and deep understanding of the works – and thus to illustrate the possibilities and necessity of nuanced interpretations that take into account the text, subtext, and literary references. The task, which the author sets out and performs, starting from such a clearly defined research perspective, is both remarkable and impressive in its momentum and size. This anthology of plays by Boguslaw Schaeffer, a Polish playwright, composer, musicologist and graphic designer. The plays are examples of Instrumental Theatre. Like Schaeffer’s microtonal compositions, they are carefully structured and employ cyclical repetitions and codes. Romanska’s translations not only bring Schaeffer’s unique works to an English-speaking audience, but do so in a way that preserves the rhythm, humor, and linguistic play of the originals. They are a pleasure to read and frequently offer irreverent, surprising, and entertaining perspectives on contemporary art. This beautiful new volume, a collection of three plays translated by Magda Romanska, is an accessible and illustrative introduction to the work of Bogusław Schaeffer. While the plays collected in this anthology offer a rich source for those looking to engage with Schaeffer’s ideas on performativity and the production of art, they are also (and perhaps more importantly) immensely enjoyable pieces of theatre. Romanska’s translations not only bring Schaeffer’s unique works to an English-speaking audience, but do so in a way that preserves the rhythm, humor, and linguistic play of the originals. They are a pleasure to read and frequently offer irreverent, surprising, and entertaining perspectives on contemporary art.